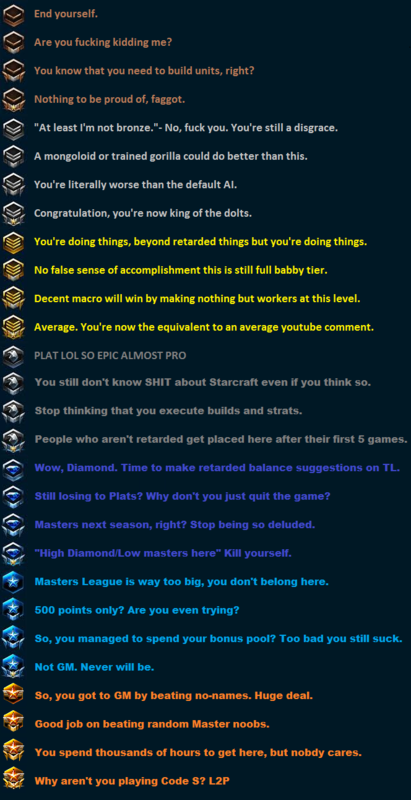 I just got diamond so according to this old meme below, I can now post retarded balance suggestions. Shield Batteries should cost Vespene Gas. Alas, according to the new ladder distribution you're still in the Platinum percentile for when this meme was made. Diamond is the new mid-low plat tho. shield batteries costing gas isn't that retarded, really. Good job on Diamond mate , do work. I remember the first time I got diamond. I got lucky and beat a Pro Korean the next day in a Zotac cup best of 1 by sheer luck and thought I was on my way....I was very, very wrong. It is, they are obviously made of pure minerals, just look at them ingame! It is, Protoss is gas dependant and everything cost gas except zealots and probes. And some structures. That's like you need to pay 50 gas for pylon. I mean, let's kill already a weakest link in sc2. Shield batteries should require a charge by absorbing shields from a nearby nexus. Shield batteries no longer replenish shields on the nexus. Let's face it realistically. Assimilators AND pylons costing gas is the only way for Protoss to be balanced again.